I’ve resisted it for over thirty years. The amount of times I’ve been guaranteed that sales would soar if we put our branding on a product made by someone else doesn’t bear thinking about. It’s always seemed a little duplicitous to me. Visiting other farm shops, I must have seen the same mass-produced biscuits and jams with dozens of different labels and it’s always seemed like the complete opposite of what farm shops should be about. Obviously, no one can make everything themselves but we should be heralding a foods provenance rather than disguising it by sticking our label on it. I don’t think I’m alone because although ‘own label’ is still prevalent in the bargain basement it seems to be on the wane a little further up the food chain and I’m not seeing it around as much on my travels. 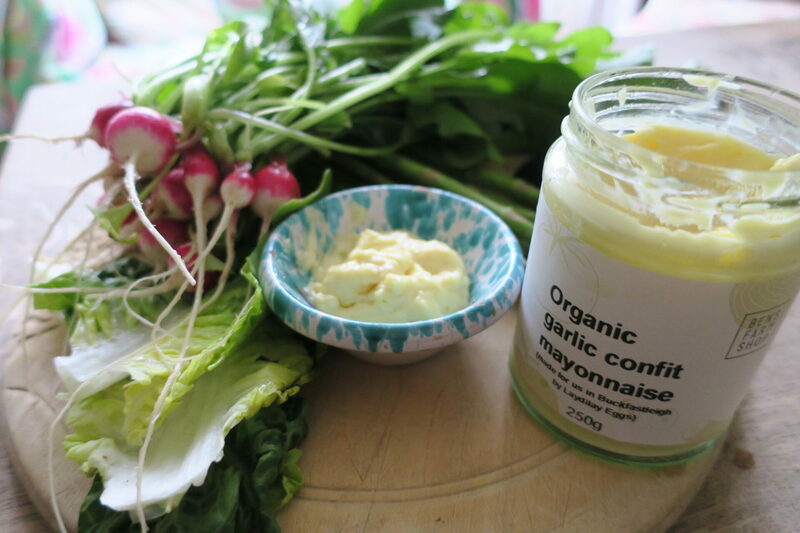 So it’s with some trepidation that we’re bucking the trend and bringing you Ben’s Farm Shop Garlic Confit Mayonnaise. It’s made by local food heroes, Laydilay, but it’s our idea and made with our garlic confit and olive oil. It’s been going down a bomb as our ‘house mayo’ in BWT so I thought it would be good to offer it in the shops. Laydilay didn’t want to commit to a label print run without seeing how it would sell so we decided to label it ourselves. The slow cooking takes the sting out of the garlic making it much more user friendly than classic aioli and the olive oil adds body. All in all, a good all-purpose mayo withenough points of difference to serve as if it was your own. All the ingredients are organic and we’ll get it certified if it looks like a runner. This entry was posted in New Products, Shop News.